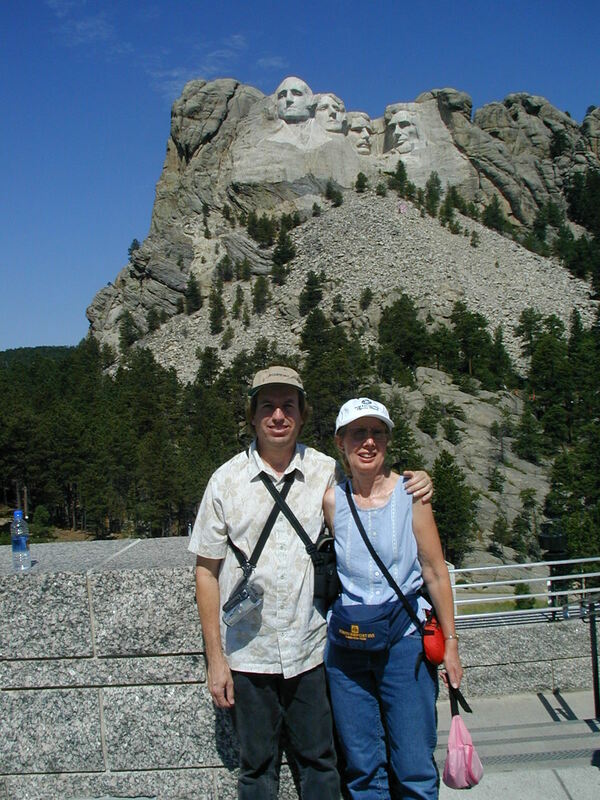 These photos of Mount Rushmore National Memorial were taken July 23-24, 2006. 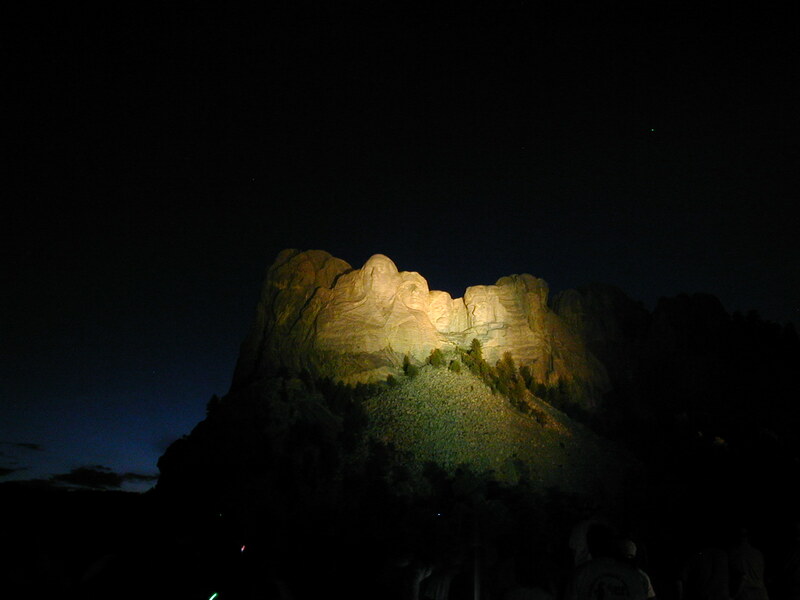 Mount Rushmore at night with floodlights on. We arrived at Mount Rushmore after dark, but in time for the nightly "Lighting Ceremony". 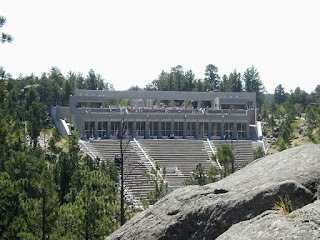 The amphitheater was full, but we were able to find a good spot on the Grand View Terrace above the amphitheater to view the lights slowly turning on and lighting the memorial. The brightest light is in the center of the monument, which creates an interesting effect whereby local hero Theodore Roosevelt, in the rear-center, lights up first! The candle-power of these lights is unbelievable. The lights are not that close to the mountain, in fact they are hidden in the trees directly adjacent to where this photo was taken. (See photo of lights below.) 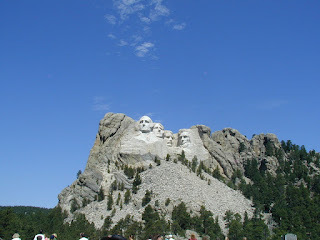 The Park Service must have a monster power bill! 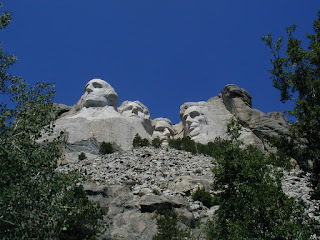 After the lighting ceremony we returned to our hotel in nearby Keystone, S.D.. Keystone is the closest town to Mount Rushmore. 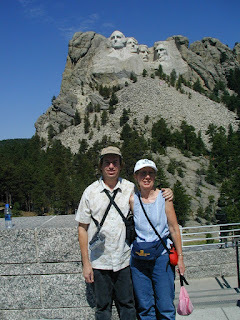 The next day we returned to take a more leisurely look around the memorial. 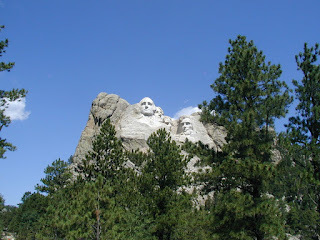 See my Black Hills South Dakota Stock Photos which include a photo of Keystone as well as other must-visit places nearby. Note to stock photo users: There are lots of random people in these photos, I have slightly blurred some of the faces to protect privacy and it is noticeable on some of the photos. Julie and myself hereby provide a model release for use of our image where they appear in these photos. Looking through the entry gateway. Just beyond the gateway you pass through a couple of visitor facilities areas (gift shops, rest rooms, and food services). 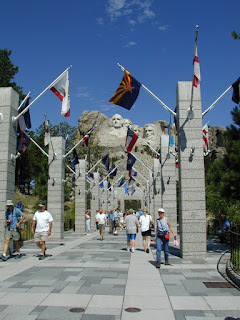 Then you walk toward the memorial down The Avenue of Flags, shown in this photo. Julie is on the right walking toward me. OK, I have to take a break for a moment and put on my landscape architect hat for a little professional criticism. I have a big problem with the design of this facility. The Avenue of Flags walkway leading toward the Memorial is way too narrow for the number of people using it. 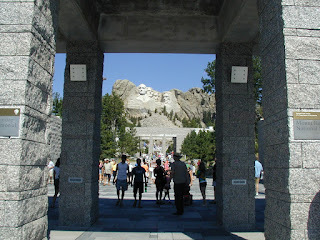 You must pass through it on both the way to, and way back from, the Memorial viewing areas. Don't be fooled by the photo, I waited a long time to get a break in the foot traffic so I could get a shot that wasn't solid people. This is an example of bad design, a case of art taking precedence over functionality. The park service landscape architects normally do much better than this. The problem could be avoided if foot traffic returning back from the Memorial took a different return walkway, essentially make this a "one-way" path toward the Memorial and cutting the number of people on it in half. The crowds really ruin the effect and it wouldn't be that hard or expensive to solve the problem. View near the start of the Presidential Trail. 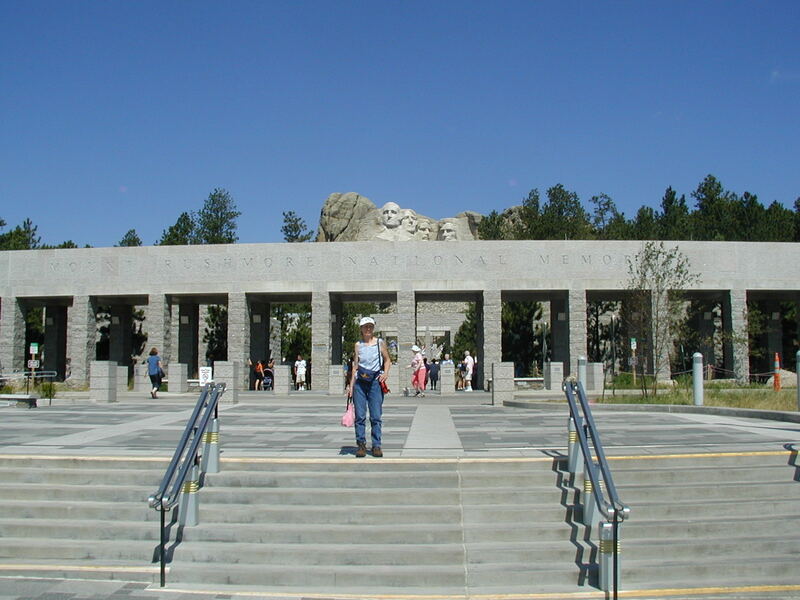 The trail loops from the Terrace up along the base of the mountain under the Sculpture for a closer view. The trail is a combination of pavement and elevated cat-walks. Very nice design. Closer view from the Presidential Trail. 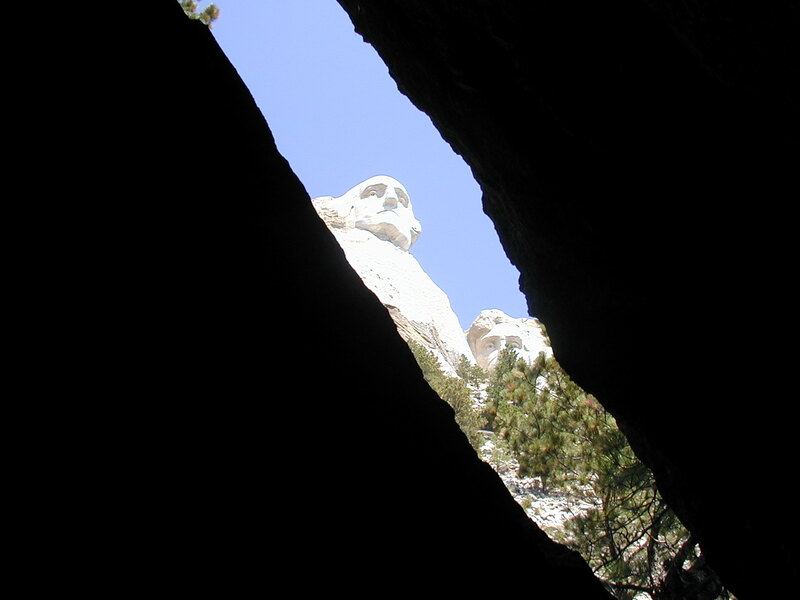 Looking up at Washington through a crack in the rocks below. Close up view. Check out how the sculptor, Gutzon Borglum, created the illusion of glasses on Roosevelt's face. The location of each face was determined by the location of carve-able rock surfaces. 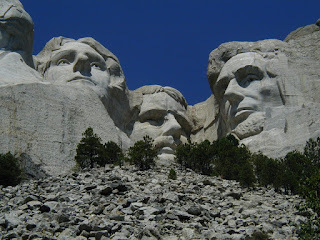 They had to be adjusted from the original plans during the carving when the sculptor discovered some of the rock was not solid enough to be suitable for carving. Looking backwards from the base of the sculpture/mountain, back toward the amphitheater. The building at the top-rear of the amphitheater with the large glass windows is the Lincoln Borglum Museum. The Grand View Terrace is on the roof of the museum where you can see people standing. The Avenue of Flags is on the far side of the museum, mostly out of view (you can see the flags if you click on the photo for the full size photo and look close). 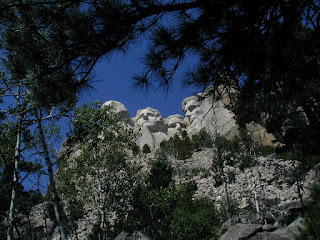 The faces through the trees. This is the scaled mock up of the sculpture the artist used to show what he intended to create. 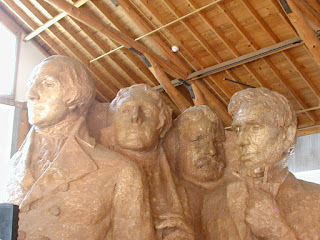 Note that the artist's original proposal was for a full bust of the presidents rather than just the faces. If you compare it with the actual built monument you can also see how the positions changed during actual carving due to areas of bad rock. Tools used during sculpting. 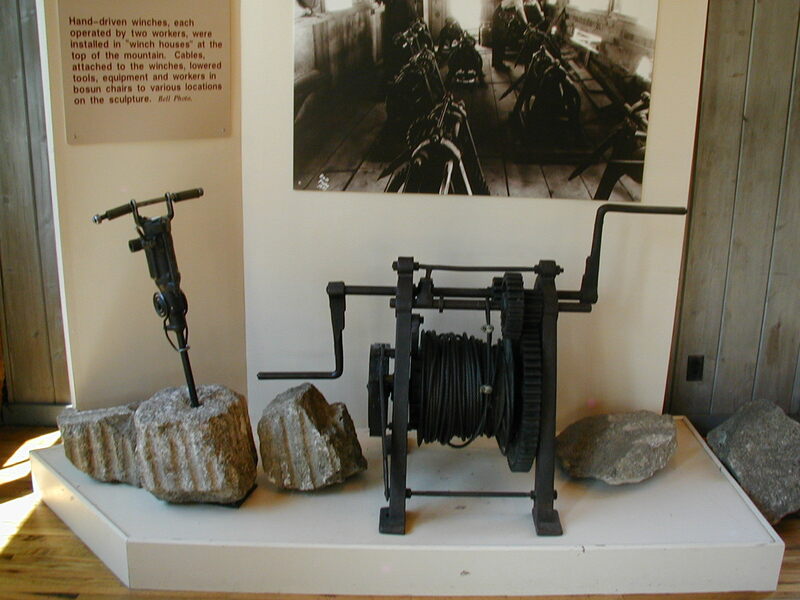 The hammer drill on the left was one of those used to drill holes for explosives to blow away the rock and create a rough outline of the faces. Jack hammers and polishers were used for more detailed finishing work. A large wood platform was built on top of the mountain and the workers were lowered to their work stations in "bosun's chairs" hanging from cables. 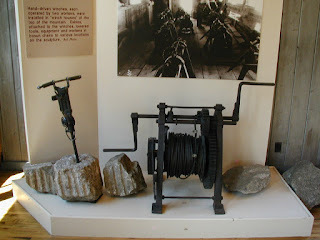 The winch on the right was used to lower and raise workers down to the sculpture. A long wood stairway was built up the mountain for the workers to climb to the top work platform. 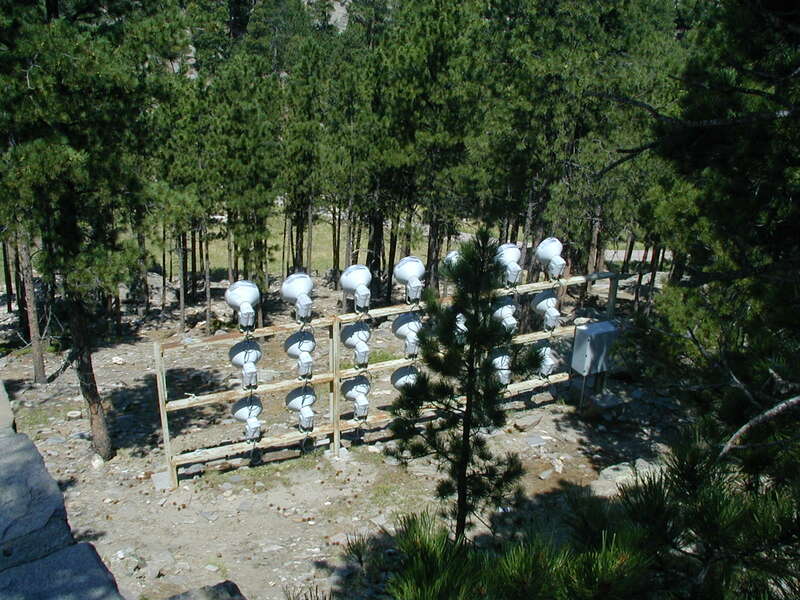 Tools, equipment and workers were also taken to the top of the mountain on a temporary aerial tramway. One of the bosun's chairs. 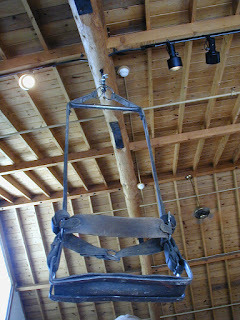 The worker sat on this chair suspended by a cable as he drilled, carved, or polished the rock. A bust of Gutzon Borglum, the sculpture. 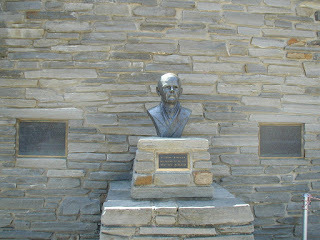 This bust was made by his son Lincoln Borglum. 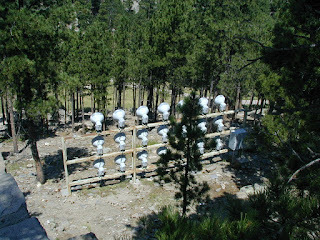 These are a few of the flood lights used to light the mountain at night. This is the glue that holds the sculpture together. Well, not exactly, but close. 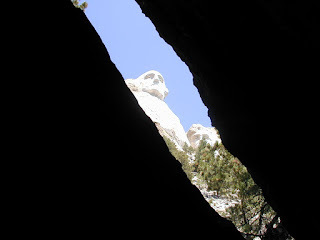 Like most granite, the granite the sculpture is carved in has cracks in it. If water was allowed to get into the cracks it would freeze in the winter and the expanding ice would break apart the sculpture over time. 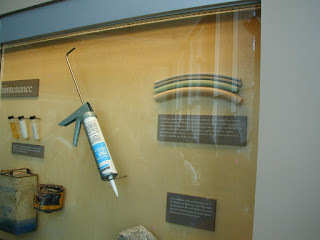 So the cracks are sealed using foam backing rods and good old Dow-Corning #790 silicone caulk. Granite dust is sprinkled on the surface of the wet caulk to make it blend in with the rock. Be sure to visit the other great attractions in the area around Mount Rushmore. 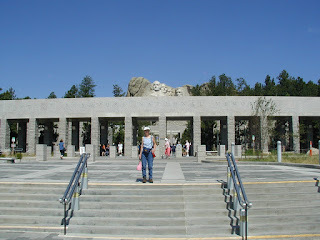 See my Photos and Video of Custer State Park, The Needles Highway, and Iron Mountain Road for a preview.